you are here: :Home - Discount Offer, PMP, PMP Exam Tips, Resourses - The ULTIMATE online learning tool to become a PMP®! – get 10% OFF now! The ULTIMATE online learning tool to become a PMP®! – get 10% OFF now! Register Now using Code "Dec18" and receive 10% Discount! Exclusive Offer – only this Month, act now! : Get the most popular PM PrepCast at a nice discount! The well-known, popular PM PrepCast is probably the best online learning tool you can get to assure your exam success within that short time! Do not hesitate to secure your package now at this special price till Dec, 31st! Act now! Increase your chance of passing the PMP® Exam. You will receive real-world examples to help you truly understand the PMP® exam concepts. Simple memorization won’t gets you there. Plus, our course makes you a better project manager, too. Study anywhere and reduce your study time because you can maximize your day by listening anywhere your tablet or smart phone goes. For instance, you can listen when you drive to work when you are outside riding your bike, or watch a lesson over lunch, as you are sitting on the bus or when you are waiting in line at the post office. It’s the anytime study miracle! You hear from some recent PMP® exam takers: Learn their best practices on how to apply, study and pass the exam the first time. It’s simple to get through – You’ll find that the 47 processes and 10 knowledge areas from the PMBOK® Guide are not as difficult as they may seem. You learn the concept, tools & techniques that are not covered in the PMBOK® Guide but required for the exam without having to read dozens of other books. It’s mobile! Carry The PM PrepCast with you as your “Personal PMP® Trainer” whenever you want to study, wherever you go. The ideal combination to the PMPrepCast ist the best-selling product that has helped thousands of Project Management Professional (PMP)® aspirants pass the PMP® exam – The PMP Exam Simulator! 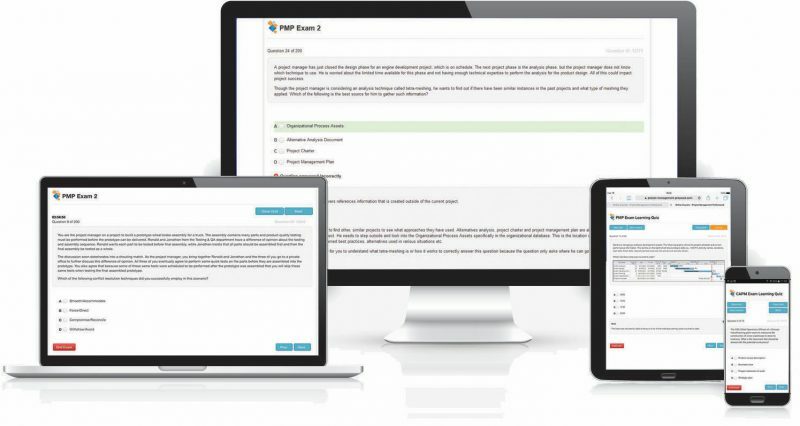 The PM Exam Simulator™ gives you an “insider’s view” of the actual PMP Exam. Practice on 1,800 highly realistic PMP Exam sample questions based on the current A Guide to the Project Management Body of Knowledge (PMBOK® Guide). Prepare “like real” with the 90-day access as often as you want. Read detailed explanations alongside all answers and learn why your answer was / was not correct. Learn useful test taking strategies with The PM Exam Simulator and pass the PMP Exam on your first try! More than 3100 PMP aspirants already joined us!